Today, June 20th, it’s one of those days in which the more bizarre things are celebrated: The Ice Cream Soda Day!! 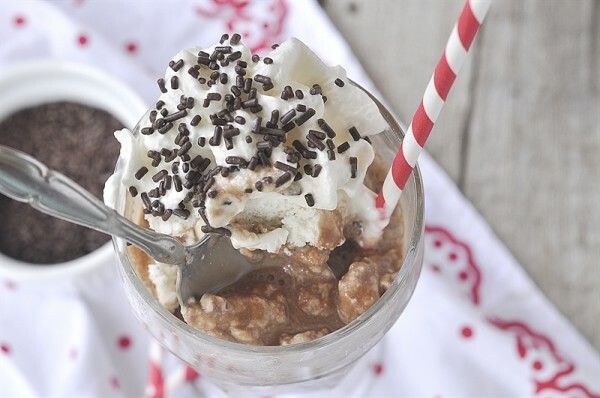 a day to commemorate this delicious dessert-beverage made of just ice cream, soda (or its varieties) and whiped cream and which taste sooo delicious despite what many people think about the combination. La receta es extremadamente sencilla. Sólo necesitas helado de tu gusto, agua mineral o carbonatada, chocolate líquido, crema batida y chispas para decorar. The recipe is quite simple. You just need the ice cream of your choice, Canada Dry, chocolate syrup, whiped cream and sprinkle for decoration. En un vaso o copa, vierte chocolate lìquido. Decora con crema batida y chispas a tu gusto. In a glass or cup pour the chocolate syrup. Top with whiped cream and sprinkles. Variación: puedes usar una Guinness en lugar de soda para hacer una bebida diferente. Variation: you can use Guinness Ale instead of soda. This entry was posted in Recipes and tagged food, summer by bazarikamx. Bookmark the permalink.